A couple months ago, the company SCOTTEVEST sent me a trench coat to test drive. My husband got their fantastic Essential Travel Jacket awhile back and seeing as I’ve been envious of his coat ever since, I eagerly accepted the company’s offer. There are 18 pockets in this coat. I can fit my Kindle, son’s diapers and wipes, two Epipens, wallet, iPhone, small camera (a Canon PowerShot SD600), keys, sunglasses, zip-top bag for receipts, a stack of Band-Aids, and still have pockets available to hold more stuff. Even with all of these things in my coat, you can’t tell the pockets are loaded. When wearing the coat, I have no need to carry a purse. Having my hands free is an incredible benefit when chasing after a toddler, and I don’t have to worry about losing my purse or it being stolen. (Sure, I could be pick-pocketed while wearing the coat, but I doubt there’s a thief out there who knows how to get into all 18 pockets undetected.) It’s also very nice at the airport because a coat doesn’t count as a carry-on bag. I fill my coat with my regular carry-on items, and then put my clothes and laptop in a traditional carry-on bag — avoiding the checked baggage fee. 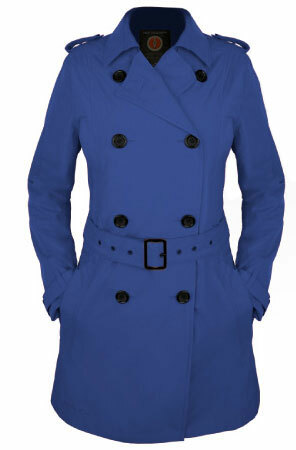 The sizing for the product is accurate, the material is durable, and it’s an attractive coat. I get compliments on it every time I wear it. I’m such a fan, I’m planning to buy a second one in black to wear for more formal occasions. My only complaint is that it doesn’t have an optional wool-lining insert that would make it a four-season jacket. The SCOTTEVEST trench coat is uncluttered in appearance and application (no additional purse to carry), and since each item I’m carrying with me has its own pocket, it’s also incredibly organized. I don’t waste time hunting for anything I need. I wish all coats were this practical. 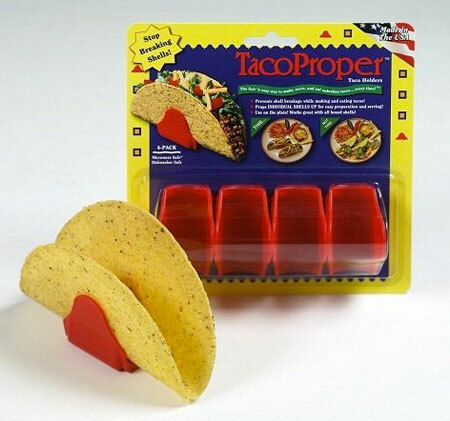 Rest easy tonight, the world is saved from tacos tipping over on your plate! Thanks to reader Julie for sharing this unitasker with us. Pretend to be a lawyer, and log your work in 15 minute billing intervals. You can download basic free time-tracking software from numerous companies to help get you started. Programs that automatically prompt you to input your progress are similar to an alarm that reminds you to stay on track. Identify very specific action items each hour. At the top of every hour, take two minutes to write out exactly what you plan to accomplish that hour. Then, work as diligently as possible to finish those action items. It’s a lot easier to get where you want to go when you know where you’re headed. Make yourself accountable to someone else. If you have a colleague or buddy who is game, tell her you want to be finished with a task by a specific time. Then, when that time rolls around, the person checks in with you to see how it went. Be kind and return the favor when the other person needs your assistance. Race a colleague to see how much work you can both get done in 30 minutes or an hour. Set an alarm, and go. Make the prize something small and fun, like the loser is responsible for refilling both of your coffee mugs. Laundry rooms are often dark corners of basements or narrow closets with barely enough space to fit stacked machines or odd hallways leading to the garage. Rarely are they beautiful rooms that entice us to keep up with the tedious chore. However, a clean, uncluttered, organized laundry room is welcoming and makes doing laundry much more enjoyable. Additionally, an organized room speeds up the process so you spend less time doing what you may not enjoy. Clean it up. Start by removing everything from the space that isn’t attached to the walls. Ironing boards, detergent, hampers — whatever you have in this area needs to be temporarily removed. Once everything is gone, sweep and mop the floors, wipe down the walls, dust, and get the room looking like new. Paint the walls if necessary. Even clean underneath and behind your washing machine and dryer, but be careful not to disconnect your water, drainage, power, and/or gas lines. Sort it. Before returning a single item to the laundry area, decide if it really belongs in the space and if the item meets your needs. You probably don’t need motor oil in your laundry room and you certainly don’t need a bottle of spray starch that is more than a decade old. Get rid of anything you haven’t touched in at least a year and only keep the things you actually use. Be inspired. Head to Google images and do a search for “inspiring laundry rooms.” Pages of gorgeous rooms will appear to give you a laundry list of ideas. Identify your needs. A laundry room that handles the clothes loads of just one person will have different needs than a laundry room for a family of six. Do you need room to fold clothes? Do you need cubbies for each person in the house? Do you need a bag for dry cleaning items that accidentally slipped into the dirty clothes hamper? Make adjustments. If you need a shelf above your washing machine, now is the time to add these fixtures to the room. If you want an ironing board and iron holder that fits on the back of your door, install it. If you have been dreaming about having a clothesline or rolling garment rack, add them now. Make structural additions to the space that will help you on the days you do laundry. Wipe it down. Now is also a good time to wipe down any items that will be returning into the laundry area. Remove the dust and gunk that builds up over time. Store items where you use them. As you begin to return items to the laundry room, be sure to put things where you use them. Detergent and stain treatment products should be within an arm’s extension of the washing machine. A rolling garment rack and extra hangers should be immediately next to your folding area or the dryer. 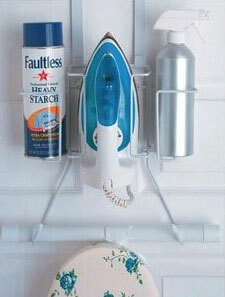 Your iron should be with your ironing board. Label locations. If you aren’t the only person who uses the laundry room, label shelves and cupboards well so everyone can know where to find products and where to return them when they’re finished. Don’t forget donations. Every laundry room should have a box or a bin where you can easily deposit items of clothing that are ready to be donated to charity. Make it as simple as possible to get the unwanted items out of your wardrobe and ready to be passed along to someone else. Use it. Take advantage of your clean, uncluttered, and organized laundry space by keeping on top of your laundry chores. Have set days on the schedule for when you will tackle the wash. Ask Unclutterer: How can I disguise workout equipment? My question for the day is how do people incorporate the big exercise equipment into their homes? I am thinking of a treadmill. I have thought of getting some decorative screens and walling it off when not is use. It is currently in the family room, which has multiple personalities — home office, tv room, and gym. I’d love to know your thoughts and ideas, as well as other reader’s suggestions. I must admit, I am truly stumped by what to do with exercise equipment in the absence of a dedicated workout room. Treadmills are so difficult to incorporate into a room that serves other purposes. Screens scream, “THERE IS A TREADMILL BEHIND HERE!” In bedrooms, treadmills become dirty clothes hampers. And, in television rooms they’re always in the way. If you didn’t already own a treadmill (and you had a lot of money), I’d suggest you check out the XFit. It’s a workout room in an armoire. A brilliant idea that I wish weren’t so expensive. This is one of those times when I think it best to let our readers give you the advice. Someone has to have a solution. (Please, someone have a solution!) I have always been at a loss for what to suggest for disguising workout equipment. So readers, please give Cindi a hand and offer up your suggestions in the comments. I’ll also be reading to see what everyone has to say because I need the advice as much as Cindi. Thank you, Cindi, for submitting your question for our Ask Unclutterer column. And, sincerely, I hope someone has better advice for you than I do on this topic. My selection this week isn’t from our Flickr pool. 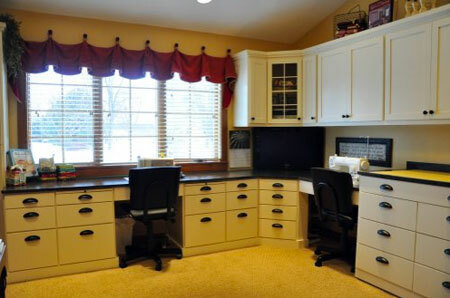 I stumbled upon this truly amazing sewing room while looking for inspiration for our guest room. The picture I’ve attached to this post doesn’t look all that impressive, but the detail images in the full article describing the space are remarkable. There is sincerely a place for everything, and everything is in its place. Even if you aren’t someone who sews, you can find inspiration from this room for how to organize other hobbies and even a traditional workspace. I’m a fan of Heather Peterson’s mom’s custom sewing room, and I strongly recommend checking out her post about the space. A couple months ago, I was at the pharmacy picking up a medication for my son because he had a truly disgusting sinus infection. I had him in a stroller because I didn’t trust him to keep his bug-ridden hands to himself and because a 22-month old loose in a pharmacy is rarely a good idea (especially one who enjoys impersonating a tornado). While we were waiting on the prescription to be filled, a woman came up to me and told me that my son was “too big to be in a stroller” and if “I knew how to properly control him” I wouldn’t need to use it. I didn’t know this woman, I hadn’t even made eye contact with her, and I certainly wasn’t wearing a t-shirt that said, “Please critique my parenting choices.” Irrespective of this, she still felt the need to reprimand me for using a stroller. I thought about lying and saying that my son had polio or a congenital spinal deformity in an attempt to make her feel guilty for being rude to me, but I didn’t. Instead, I simply offered up my son’s snotty hand and said she was welcome to walk around with him while we waited. This is by no means the first time I have been chastised by total strangers for raising my child differently than how they think I should. And, I’m doubting it will be the last. It has been a wonderful reminder to me, however, to not clutter up my time worrying about what other people are doing as long as they’re not actually injuring themselves or others, putting another person or themselves in harm’s way, or violating another person’s rights. As annoyed as I might be by a person driving a few miles below the speed limit, I just assume there is a reason and give the person the benefit of the doubt. As irksome as it is when someone’s cell phone rings in a movie theater, I just assume it must be an emergency and go back to enjoying the film. If I see a tall child in a stroller, I know the kid is safe and don’t let it bother me. Not letting these minor frustrations get to me frees up my emotions and time to focus on things I enjoy and want to do. There are only 24 hours in a day, and I have decided not to fill that time being frustrated by other people and negative situations that are out of my control (again, assuming nothing really bad is occurring). I barely have the energy to do all of the things I want to do, and giving people the benefit of the doubt helps me to stay in control of my emotions and time. In light of practicing what I preach, from this point forward I’m just going to assume that the woman who criticized me about having my son in a stroller was having a bad day. She likely felt the need to yell at me because someone had probably screamed at her. I ended up getting a good reminder out of the situation (give people the benefit of the doubt) and an introduction for a post (this one), so at least a couple good things came from the tongue lashing. Teri makes difficult decisions about what stays and what goes during her move into her new space.